A storage container turns into a overnight B&B. Storage containers are proving to be convenient building blocks for everything from classrooms to houses to hotels. Container hotels have especially popularized the idea of a “pop-up” structure that can be easily assembled in a short amount of time. A new smaller version of the container hotel by a European based company that acts more like a portable bed and breakfast, providing guests with a comfortable place to rest in much more intimate locations. It is comprised of six shipping containers in all: four containers for guest rooms, one for a breakfast/lounge area, and one to be constructed for a sauna room. The main draw for the small-sized container hotel is its ability to easily pick up and move to more intimate locations, while still providing a comfortable bed and hot shower nearby. Since it takes up much less space, the various rooms could be set down outside a concert, in a park, or even on a bustling city street, all in a matter of hours. If your interested in a container from AZ Containers call us at 602-723-9608 to see how the most basic steel box or a customized, climate controlled storage or workspace with windows, we’ll have your solution on it’s way to you fast. We provide our customers with a personal, fast and efficient service, which will offer a hassle free solution to any storage problem. More importantly, there are no hidden costs when purchasing, leasing or RENT TO OWN storage containers from us. http://34.219.237.230/wp-content/uploads/2018/08/logo2-1.png 0 0 admineli http://34.219.237.230/wp-content/uploads/2018/08/logo2-1.png admineli2018-12-29 20:16:222018-12-29 20:17:13A storage container turns into a overnight B&B. This modular design concept can work well in places where mobility, efficiency and low-cost are key requirements. Container structures can be moved from site to site, and their compact design saves space and keeps things simple and tidy. If your interested in a container for a project like this or something similar, contact AZ Containers at 8602-723-9608 to see how the most basic steel box to a customized, climate controlled storage or workspace with windows, they’ll have your solution on it’s way to you fast. We will provide our customers with a personal, fast and efficient service, which will offer a hassle free solution to any storage problem. More importantly, there are no hidden costs when purchasing or leasing storage containers from us. This home shows how spacious and modern a project like this can be, created by Architect’s in New York and Florida, the Savannah project makes a very nice small house. 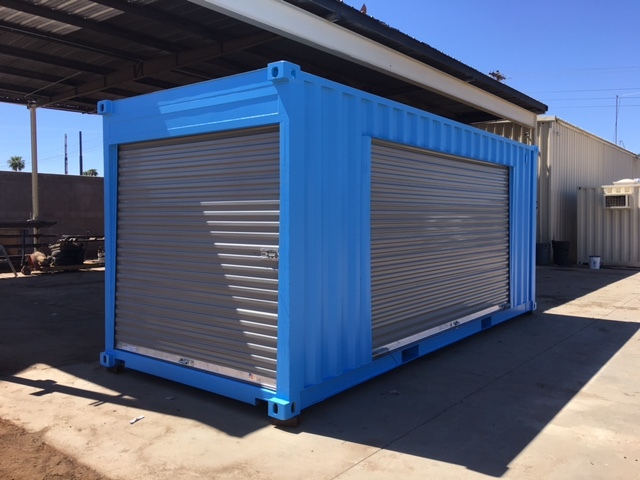 If your interested in a container for a project like this or something similar, contact AZ Containers at 602-723-9608 to see how the most basic steel box to a customized, climate controlled storage or workspace with windows, they’ll have your solution on it’s way to you fast. Canada’s First Container Housing Development Built in Vancouver. Early last month, Canada got its first recycled shipping container housing development. It is located in the Downtown Eastside area of Vancouver, at 502 Alexander St. The housing project was developed by a Women’s Resource Society, which wanted to create affordable and quality non-market housing units to be rented out to older women. The base structure of this three-story housing development was constructed from 12 recycled shipping containers. The walls of the units are spray-foam insulated and finished with drywall. The development meets all the national building codes, while it even exceeds the code requirements for insulation and sound transference. The construction took approximately 8 months, with the first shipping container being transported to the building site on November 30th, 2012 and the project being finished in July 2013. The hard construction costs were $82,500 per unit. Out of the 12 recycled container units, four were donated. The remaining eight containers were purchased through a broker. The containers contain steel and are worth about $5,000 each, which would typically be too expensive for such an affordable housing development, according to the project development manager. If your interested in a container for a project like this or something similar, contact AZ Containers at 877-292-6937 to see how the most basic steel box to a customized, climate controlled storage or workspace with windows, they’ll have your solution on it’s way to you fast. http://34.219.237.230/wp-content/uploads/2018/08/logo2-1.png 0 0 admineli http://34.219.237.230/wp-content/uploads/2018/08/logo2-1.png admineli2018-12-29 19:48:192018-12-29 19:49:00Canada’s First Container Housing Development Built in Vancouver. AZ Containers, what we’re made of. AZ CONTAINERS offers an assortment of options to address any storage need. Storage containers conform to ISO dimensions and are available in 20′ and 40′ sizes. All ground-level containers are made of 14 gauge, corrugated steel and are air and watertight. These “mini-warehouses” provide safe, secure storage space for the short or long-term use. We provide our customers with a personal, fast and efficient service, which will offer a hassle free solution to any storage problem. More importantly, there are no hidden costs when purchasing or leasing storage containers from us. http://34.219.237.230/wp-content/uploads/2018/08/logo2-1.png 0 0 admineli http://34.219.237.230/wp-content/uploads/2018/08/logo2-1.png admineli2018-12-29 19:36:132018-12-29 19:36:13AZ Containers, what we’re made of. You can now RENT TO OWN at AZ CONTAINERS. http://34.219.237.230/wp-content/uploads/2018/08/logo2-1.png 0 0 admineli http://34.219.237.230/wp-content/uploads/2018/08/logo2-1.png admineli2018-11-25 18:30:452018-11-25 18:32:54You can now RENT TO OWN at AZ CONTAINERS.